A new replacement airbag inflator is seen just before being installed in a Jeep. A new study highlighting the flurry of U.S. automotive recalls asserts that automakers and suppliers remain focused on innovation and cost cuts while vehicle quality takes a hit. The study, "The Auto Industry's Growing Recall Problem -- and How to Fix It," shows that automakers and suppliers paid almost $11.8 billion in claims and recorded $10.3 billion in warranty accruals for U.S. recalls in 2016. That $22.1 billion total is an estimated 26 percent increase over the previous year. Michael Held, enterprise improvement director at the global consulting firm AlixPartners, which led the study, told Automotive News that automakers and suppliers totaled an estimated $17.5 billion on claims and warranty accruals in 2015. The number of vehicles recalled in the U.S. in 2016 rose 4.5 percent to 53.1 million, from 50.8 million in 2015 --making 2016 the highest year on record, the study says. 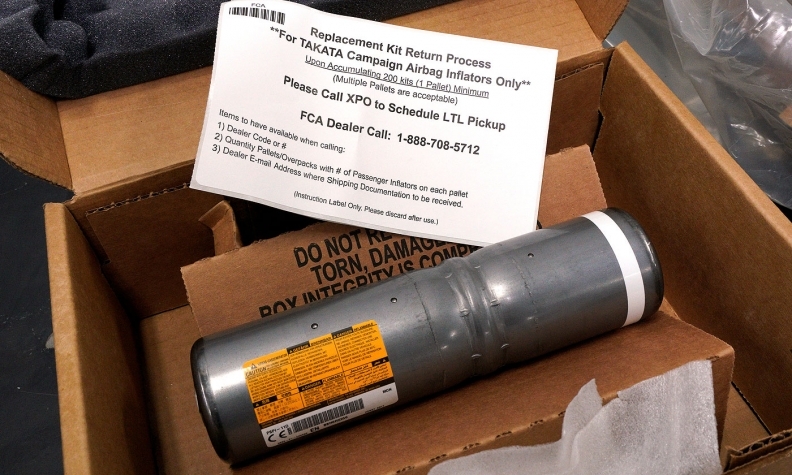 Nearly half of those recalled vehicles were attributed to Takata Corp.'s defective airbag inflators or General Motors' faulty ignition switches, which combined for 23 million. 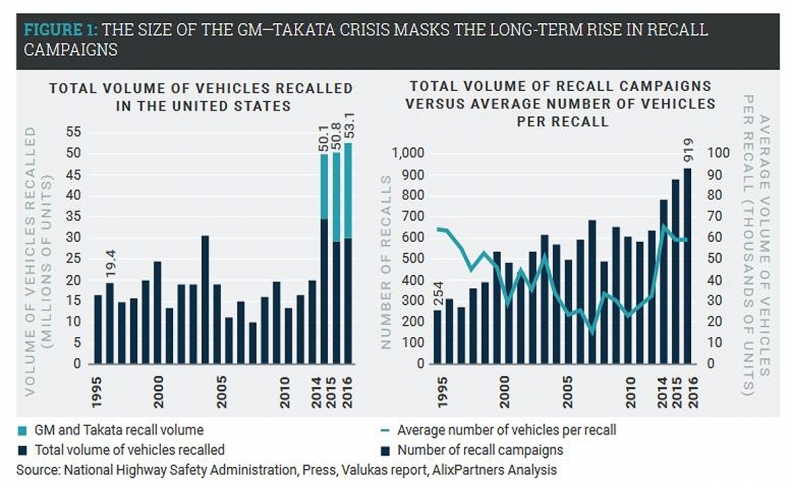 In addition, suppliers' share of total recall costs has tripled from 5 to 7 percent from 2007 to 2013, to 15 to 20 percent since 2013, according to the study, while "the frequency that suppliers are named in recall notices has doubled." According to the study, the number of recalls related to electronic and electrical systems have risen nearly 30 percent per year since 2013, compared with 5 percent annual increases from 2007 to 2013. This signals a growing interest in more sophisticated infotainment and safety systems, the study says. Recalls related to system integration can affect greater numbers of vehicles than can manufacturing problems, which are often restricted to one plant or region and a limited time frame, the study says. "Because most automotive OEMs have adopted global platforms, there is now far less local variation in vehicle content," the study says. "As the number of vehicles using similar systems increases, so do the number of issues detected since the larger production volumes attract closer observation. As a result, recall notices are increasingly likely to involve not thousands but millions of vehicles." As automakers focus on profit and cutting costs, the study estimates that automakers and suppliers have slashed spending on quality functions by 30 to 50 percent since the start of the Great Recession. "There's little evidence that OEMs are moving aggressively to address these issues," the study says. "In fact, most of them can't (or at least don't) quantify for investors how much quality shortfalls are costing them." The study recommends that companies calculate the total cost of quality by measuring the costs associated with finding defects before the vehicles hit the market, as well as warranty and recall costs. "As they undertake these transformations, many companies are learning that they don't have a handle on the cost of quality," the study says. "As a result, have difficulty prioritizing emerging issues before vehicles or components reach the marketplace."